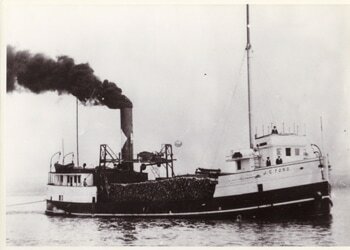 The Steamer J. C. FORD was built in Grand Haven, MI in 1889 by Thomas W. Kirby and was initially employed by Mr. Kirby as a bulk freighter, hauling iron ore. Her dimensions were: length, 172 feet; beam, 33 feet; hull depth, 12 feet; and gross tonnage, 520 tons. In 1891, the Ford was rebuilt at Grand Haven and converted to a package freighter. A second deck was added, which increased her tonnage to 710 tons. In 1892, the J. C. FORD was sold to Captain Sidney Scott of Detroit and for a time was employed as part of Captain E. B. Ward’s famous Lake Superior Fleet. In 1902, the vessel was again rebuilt, presumably due to another change in service requirements. Her tonnage was reduced to 609 tons. Finally, the J. C. FORD was sold to Captains W. T. Ramsey and Percy Ramsey of Sault Ste. Marie, Ontario and employed in the lumber trade. On November 26, 1924, the Ford caught fire, burned to the waterline and sank near Little Trout Island (Northwest of Drummond Island). While traveling light from Cleveland, Ohio to Thessalon, Ontario, with the schooner barge J. A. FRANCOMB in tow, to pick up a load of lumber, the J. C. FORD ran aground near Little Trout Island, at night, during a sudden and severe snow storm. The Ford had no radio and thus the crew was unable to report their situation and request assistance. Around daybreak, the crew of the U. S. Coast Guard Cutter CHIPPEWA noticed from a distance that a vessel (the J. C. FORD) was on fire near Little Trout Island. By the time the CHIPPEWA arrived at the scene, the entire vessel was engulfed in flames and the crew of 9 men and 2 women had gone ashore to Little Trout Island to escape the burning vessel. While attempting to extinguish the flames and rescue the crew, the Cutter CHIPPEWA ran aground and damaged her propeller wheel. The Coast Guard was unable to save the J. C. FORD, but they did manage to take all her crew safely on board the cutter. Because the cutter was disabled, those crew members were later transferred to another vessel and taken first to DeTour and later to the Sault. The schooner barge consort was not damaged in the incident. The CHIPPEWA had to be towed to Sault Ste. Marie for repairs by another U. S. Coast Guard vessel. Wreck Description: The wreck lies in 5 to 15 feet of water. The hull is badly broken up, but divers will find this an interesting dive site. The main attraction is a large eight-foot diameter propeller. There are also many small and interesting artifacts present. The wreck lies in 5 to 15 feet of water a short distance off the westerly shore of Little Trout Island (toward the northern end of the island).